Lee Jarvis explores the politics of naming in the aftermath of Thomas Mair’s conviction for the murder of Jo Cox MP. 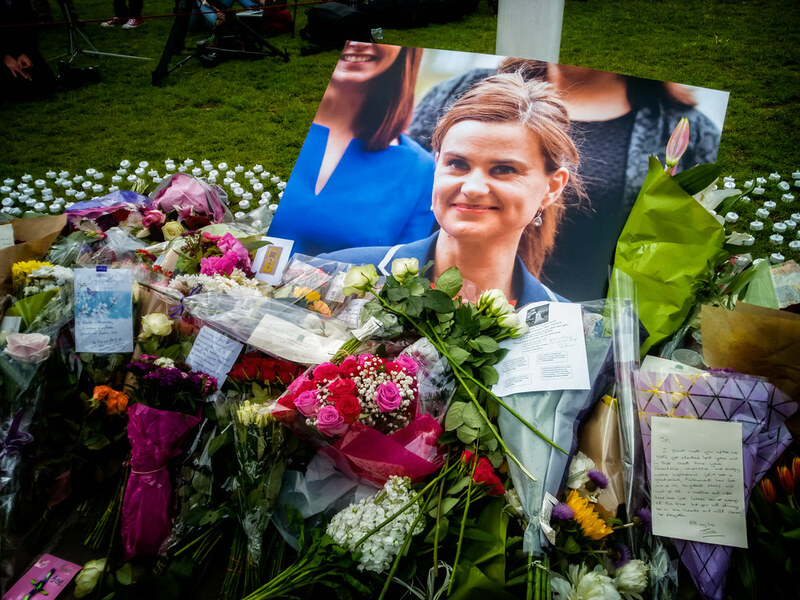 The aftermath of Jo Cox’s murder and (more recently) Mair’s conviction has seen much debate around important questions of responsibility, in particular. Was Mair’s responsibility diminished by any mental health problems he may have been suffering, was an early such concern. As was the role of some of the deeply unpleasant propaganda associated with the referendum’s ‘leave campaign’ – not least Nigel Farage’s ‘Breaking Point’ poster. A more recent question still, however, focused on the apparent judicial and media hesitation to name Thomas Mair what – for many – he so clearly is: a terrorist. Some of these concerns focused on the use of scare quotes in media reporting of his trial and conviction, such that Mair’s description as a ‘terrorist’ might be seen by readers either as a quotation or as implying some level of ambiguity. Others have asked why Mair was charged with murder, rather than under a counter-terrorism offence. Underpinning much of this debate has been a fear – or an accusation – of double standards: a concern that similar circumspection is frequently not forthcoming when the violent actors are non-white, or – especially – when they are Muslim. In this view, mainstream media, and other parts of the establishment, are seen to be more cautious to describe the violences of right-wing, homophobic, racist or simply white actors as terrorist than they are when discussing the actions and motivations of others. Questions such as these draw upon a long history of contestation around the meaning and the application of the term ‘terrorism’ (bear with me on the scare quotes). This is a term that has been around for over two hundred years, yet continues to evade all attempts to definitively pin it down. Despite their efforts, academics, international organisations, and even individual governments have really struggled to establish a single, universal meaning for this most important and powerful of contemporary terms. Reasons for this failure (if it is, indeed, a failure) are multiple, but include: the term’s negative connotations which make objectivity in its use difficult (no-one, really, describes themself as a terrorist today); historical changes in the meaning and use of this word (it is only, really, from the mid-twentieth century onwards that the term has been primarily used to describe non-state violences against ‘innocent’ targets); the sheer diversity of violences that we might describe as terrorist (types of group; types of motive; types of strategy, etc. ); and the intrusion of political interests, such that the term is routinely used to demonise one’s opponents. Margaret Thatcher in 1987, for instance, famously said of Nelson Mandela’s group, the ANC: ‘The ANC is a typical terrorist organisation … Anyone who thinks it is going to run the government in South Africa is living in cloud-cuckoo land’. Six years later Mandela won the Nobel Peace Prize. Question 1: Does terrorism have a specific, definable meaning (or a core essence) that we might be able to pin down and perhaps even agree upon? Question 2: If terrorism does have such a meaning, what is it? What are its main characteristics? Question 3: Given questions one and two, does Mair’s violence fit with the main characteristics of terrorism? Question 4: Has the term terrorism been used appropriately by the media and others in describing Mair’s violence? Or, put slightly differently, is there inconsistency in the use of this term to describe Mair’s violence vis-à-vis the violences of others? If we answer yes to question one then we can move straight on to question two and begin attempting to pin down the meaning of terrorism. This won’t be easy – one academic book identified over 250 different definitions of this word – but it might not be impossible as lots of important words are similarly difficult to define (war; democracy; freedom; security; culture; love, etc., etc.). Once we feel we have arrived at a satisfactory definition of terrorism – which might include characteristics such as ‘violence’; ‘a political motive’; ‘a non-state perpetrator’; ‘a communicative function’ or, indeed, others, then we move on to question three. Here we must begin the evaluative task of deciding whether Mair’s violence does indeed fit the definition we have constructed. If we find that it does, then we might proceed to question four and begin thinking about inconsistencies in the use of the term. Here, our aim might be to expose hypocrisy or hidden agendas that work in the interests of some to allow the naming of similar violences in different ways. Something similar to this is frequently found in academic work on ‘state terrorism’, much of which seeks to explore why governments are so keen to describe violences which appear – effectively – identical in quite different ways when they are conducted by governments or non-governmental actors. There is, however, another route we might take that would involve answering ‘no’ to question one. We might, for instance, say that ‘terrorism’ (here come the scare quotes) is nothing more than a label that is applied to certain acts which – in the process of being labelled ‘terrorist’ – become terrorist. In other words, the naming of a particular killing or bombing as ‘terrorist’ is, here, what makes it a terrorist act: the language that we use creates the world around us, rather than represents or reflects it. If we decided to pursue this type of approach, then questions two and three become rather less important for us, and we can proceed straight on to question four. However, rather than seeking to identify errors or hypocrisies in the labelling of violences – or the labelling of Mair’s violence, more specifically – the task now would be to think through what it is that makes some violences describable as ‘terrorist’? And, at the same time, what it is that prevents others being described in this way? Whether Mair should or should not have been described as a ‘terrorist’, here, is far less important than how he came not to be described thus, and what this might say about the coherence of broader arguments or discourses around terrorist violence. The use of scare quotes, or the decision to try him with particular offences might then, have been neither correct nor incorrect. But these were decisions and it is those decisions which should be questioned, and the grounds upon which they might have been made identified, queried, and perhaps destabilised. This questions might rely upon a slightly different understanding of the purposes and nature of critique than that underpinning some of the above. But they offer, I suspect, a different way of engaging with the politics of language in such difficult circumstances. Lee Jarvis is a Reader in International Security at UEA. His books include Terrorism: A Critical Introduction (2011, with Richard Jackson, Jeroen Gunning and Marie Breen Smyth) and Anti-Terrorism, Citizenship and Security (2016, with Michael Lister). Lee teaches UEA’s undergraduate module ‘Terrorism and Counter-terrorism’. Thanks for writing this as it raises important points, I was very concerned about the media coverage of the conviction of Mair and yesterday submitted an online complaint to the BBC News site. They need to decide what their policy is regarding the use of the term and stick to it. I noticed that the title of the article covering the verdict did indeed have scare quotes around terrorist. This was completely out of keeping, and therefore editorially out of step, with other articles reporting on acts of terror – a quick search of the BBC news website turned up numerous articles on terrorists who were reported without scare quotes: especially ISIS. If the BBC are working to the assumption that terror acts need to have a political motive (which I believe is a common assumption) then Mair and ISIS tick the terrorist box not the ‘terrorist’ box. I agree with your qualifications, Lee, that the idea is contested and that is important too. For example it used to be the editorial policy of BBC World Service just not to use the term as for global listeners in different contexts it didn’t work. The cliche one man’s terrorist is another man’s freedom fighter is useful, I think, and speaks to your mention of Mandela. However this policy changed, and I think understandably and logically, after the July bombings in London (and of course would have already been influenced by 9/11). I guess it was simply that being under attack on our buses and tubes led citizens to an understanding of what a terrorist is in a particular time and place. It would make sense for the BBC to reflect that mood. But since that time the BBC has not been consistent and the Mair case shows this. It saddens me that the BBC is not ready to deal with extreme right wing and white supremacists and their ideological dispositions. They need to be as the fascists are clearly on the march and one shot a standing British MP without the UK media establishment batting so much as an eyelid. RIP Jo Cox. Get a grip BBC. . .